Growing up, I loved American comics. Published in far off New York, their creators seemed a world away and my chances of ever joining them seemed highly unlikely. 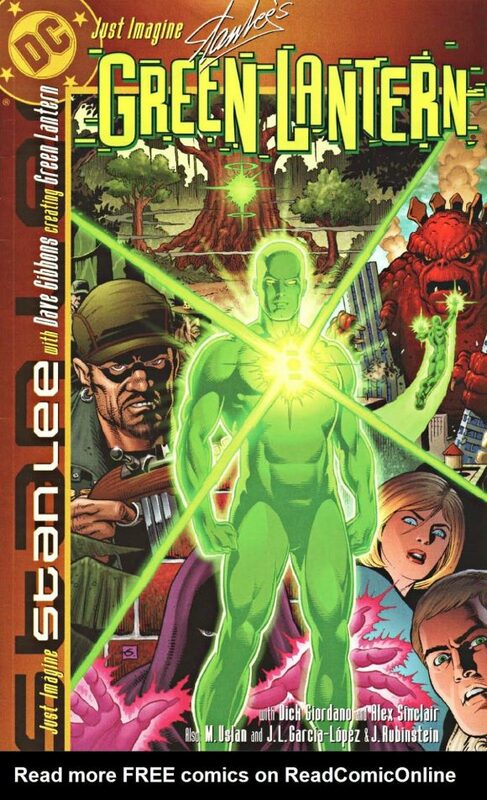 DC Comics were my first love but, increasingly, in those equally far-off days of the early ’60s, Marvel Comics, originally quite shabby and crude, were becoming more and more attractive under the direction of their flamboyant writer and editor Stan Lee. Eventually, particularly thrilled by the first issue of Marvel’s Daredevil, I wrote a fan letter and mailed it to New York. I might as well have mailed it to Mars, I thought but, amazingly, when I got in from school a few weeks later there was a blue postcard waiting behind the clock in the hall. 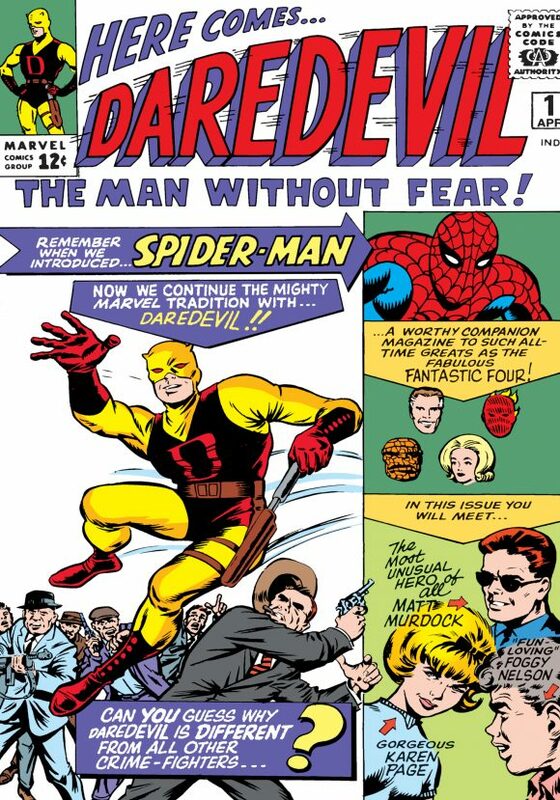 It was postmarked New York and, though the message on the back was printed, hand-written across it was: “Glad you liked Daredevil! Stan and The Gang.” I read and re-read it a hundred times. It was a tiny strand of connection across the wide ocean but connection it was. Many years later, having made that transatlantic connection more permanent, I finally got to meet Stan. He was in England to promote Marvel and we were both booked to appear on a kid’s TV programme. Over lunch, I showed Stan the faded, yet still-treasured postcard. I knew from the fan press what his reaction would be. “Fabulous” Flo Steinberg had been tasked with Marvel’s fan relations in the sixties and it fell to her to autograph letters, postcards and no-prizes. Even as a fake, the card lost none of its talismanic power for me, it just stretched the connection a little further. And now, I had shaken Stan’s hand, even had lunch with him. Not only that, but he knew and liked my work and agreed that it would be great to do something together. 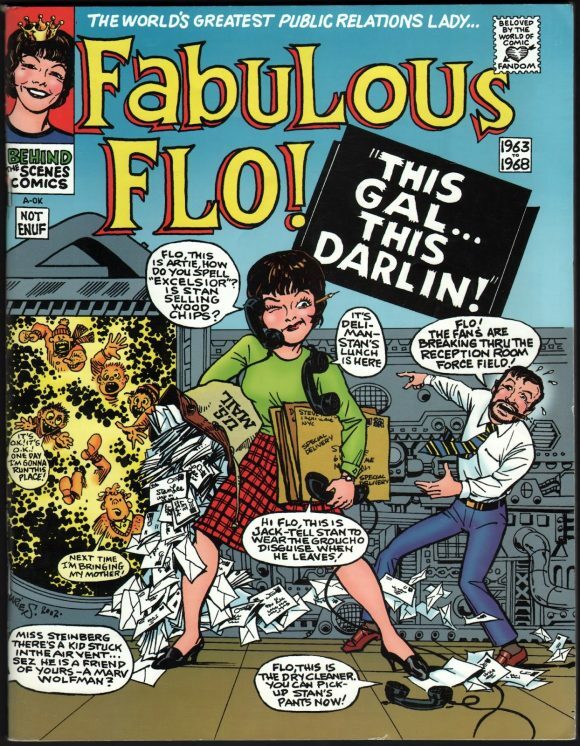 Marie Severin’s faux cover for Fabulous Flo! comics, which first appeared in Jon B. Cooke’s Comic Book Artist #18 (2002). The deal was that I’d plot and draw a story and he’d add dialogue. 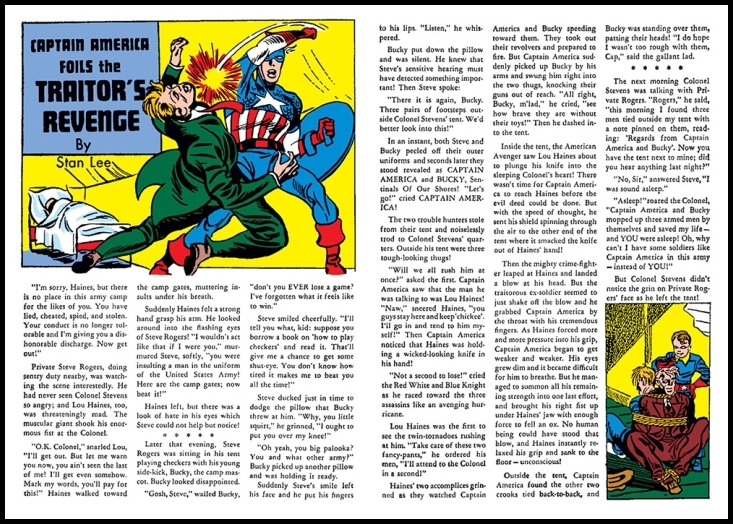 That was fine with me and I turned for inspiration to the very first story Stan had ever had published, a two-page text story in a Captain America comic from the early forties. I built out the short idea into a fully blown graphic novel, wrote a detailed plot and sent it to Stan. And waited. Eventually Stan got in touch and suggested that, as we were both going to be at that year’s San Diego Comic-Con, we should meet and discuss it. Both very busy, we met in between events and retreated to a far, quiet corner of the massive lobby, where we sat on the floor and got down to business. By that time, Stan was doing little writing and was perhaps best known as a ringmaster and spokesman for Marvel, sometimes dismissed by a younger generation as just a glib huckster. Stan was a great publicist, no doubt, but that day, I learnt what a master of storytelling he truly was. Slowly, carefully, he went through my plot, noting what he liked and what he didn’t but, most importantly, telling me exactly how I could improve it. His editorial judgment was absolutely on target. It was a master class that I felt privileged to have been given. I happily re-jigged the plot and even drew the whole thing out in thumbnail form. However, the project stalled at the Marvel offices, for reasons that remain obscure, and eventually I reluctantly put it away in the drawer marked “Might Have Been.” I didn’t make any money on it but it remains one of my most rewarding projects, if only for that unforgettable meeting with Stan. The years passed and one day, out of left field, I got a phone call from DC Comics. Now semi-retired from Marvel, Stan had agreed to re-imagine the DC Universe of characters and they wondered if I would be interested in collaborating with him. You bet I was. So it was that we created our version of Green Lantern and worked together on story and art. I held many of our creative discussions from the comfort of my home kitchen. The setting may still have been quite humble but, again, the lessons I learned were beyond price. Others will deservedly eulogize the scope of Stan’s amazing career and achievements. His contribution to comics and beyond, to global culture, is without equal and many of us comics folk might not have had our careers without the attention he brought to our chosen medium. His collaborations with Jack Kirby, Steve Ditko and others are surely among the most potent and universally enjoyed stories ever created. For myself, I feel privileged to have such personal memories of The Man. Along with that blue postcard, I will treasure them forever. — The LEE-DITKO SPIDER-MAN Graphic Novel That Never Was. Click here. 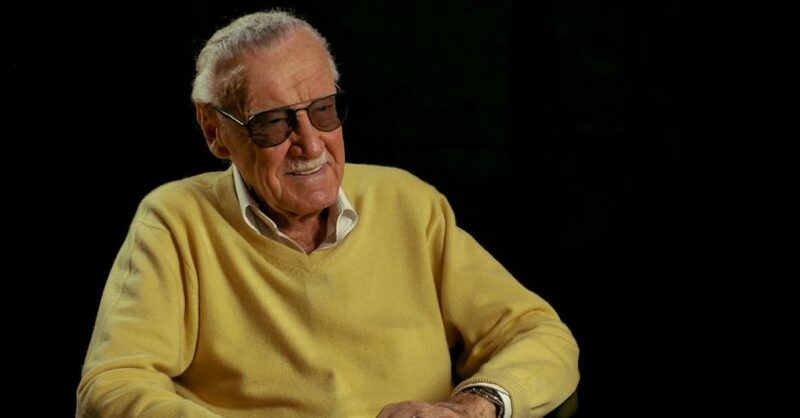 Stan Lee’s legend will live on.